Jasper Joseph Hopper and Sarah Margaret Bly are my great great grandparents, the parents of my great grandfather John Henry Hopper. Jasper Joseph Hopper was born in 1858 in Illinois. He is a son of Joshua Hopper IV and Henrietta Barrow. Read about them here. Sarah Margaret Bly was born August 22, 1862 in Keokuk County, Iowa. She is a daughter of James Henry Bly and Jane Brittain. Read about them here. On the 1860 US Census, Jasper was in Medicine, Mercer County Missouri. He was 2, and lived with his parents (farmers) and sister. On the 1870 US Census, Jasper was 12 and lived in Scott, Taney County, Missouri with his mother, stepfather John Laws, siblings and half siblings. Margaret was 8 and lived in Clifton, Wilson County, Kansas with her mother, stepfather Calvin Parton, and siblings, half-siblings and step siblings. On the 1880 US Census, Jasper was 23 and serving a 2 year sentence for Grand Larceny in the Missouri State Penitentiary in Jefferson City, Missouri. I wrote about finding those records here. Margaret (listed as Sarah) was 18, single, and lived with her mother, stepfather ,and half siblings, farming in Oliver, Taney County, Missouri. On the 1900 US Census, Jasper was 42 and Margaret (listed as Sarah) was 39. 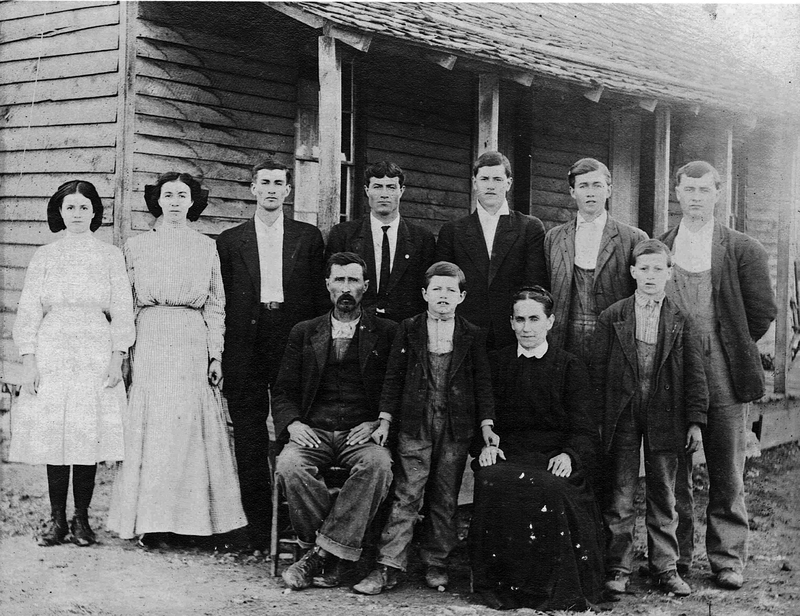 They lived in Young, Boone County, Arkansas. Sarah reported that she had given birth to 10 children, 9 of them living. Neither could read or write. They said they had been married for 21 years, but 20 years prior Jasper was in prison and Margaret was single. I haven’t found a marriage record. At home are Joseph, 13; Lillie, 11; George, 9; James, 7; David, 5; Mary, 3; Ida, 2. On the 1910 US Census, Jasper was 51 and Margaret was 48. They reported that they had been married 30 years, and indicated that it was a first marriage for Margaret and a second marriage for Jasper. They also reported that Margaret had given birth to 13 children, with 10 living. They were farming in Washington, Stone County, Missouri. The house was rented, and Jasper reported being out of work 20 weeks during 1909. Married son William, age 28, lives at home along with his daughter Anna, who is 6. Other children in the home are George, 19; Monroe, 18; David, 16; Mary, 14; Ida, 12; Harvey, 8; Everett, 6. On the 1920 US Census, Jasper was 61 and Margaret was 56. They were renting a farm in Ruth, Stone County, Missouri. Sons Harvey, 19 and Everett, 16, lived at home. Jasper died on December 16, 1929 in Ruth, Stone County, Missouri. Cause of death was a heart blockage. He was 71. His Find A Grave memorial is here. On the 1930 US Census, Margaret was 68 and widowed. She lived with her son Everett and his wife and children. They were farming in Ruth, Stone County, Missouri. On the 1940 US Census, Margaret was 78 and lodging with the Scobee family in Reeds Spring, Stone County, Missouri. After giving birth to 13 children, only 3 of her children were still in the area in 1940 – daughter Mary Jane Hopper Hedrick, son Harve, and son Everett who died that year. Margaret died on January 8, 1945 in Reeds Spring, Stone County, Missouri. Cause of death was bronchial pneumonia. She was 82. She is buried with her husband in Yocum Pond Cemetery, Reeds Spring, Stone County, Missouri. Her Find A Grave memorial is here. Jesse Hopper – I have no records for Jesse. A cousin told me that Jasper and Margaret’s daughter Mary Jane told her that Jesse was from a previous marriage. She said that Jasper got word that Jesse had died in “Indian country” which was Oklahoma, and that he went to retrieve his body. William Arthur Hopper – William was born on February 3, 1882 in Forsyth, Taney County, Missouri. He married Susie Relefa Parks on August 15, 1900 in Taney County, Missouri. (Susie is the sister of my great grandmother Maybelle Parks who married William’s brother John Henry Hopper). William and Susie had 3 children and divorced. William married Bertha Roe Moore on May 30, 1911 in Stone County, Missouri. They had 3 children and she died in 1919. William married Vinnie Roe (Bertha’s sister) on June 1, 1919 in Boone County, Arkansas. They had 12 children. They farmed in Boone County, Arkansas (1920 Census), then in Shelby, North Carolina (1937 city directory), and then in Twin Falls, Idaho (1940 Census). His World War I Draft Registartion Card indicates he was of medium height and stout build. He had blue eyes and light brown hair. His World War II Draft Registration Card indicates he was 61, had blue eyes, gray hair, light complexion, was 5’11”, weighed 255 pounds, and was blind in his right eye. William died on January 12, 1952 in Salinas, California. He was 69. His Find A Grave memorial is here. John Henry Hopper – My great grandfather John was born January 2, 1884 in Mincy, Taney County, Missouri. He married Maybelle Parks on July 14, 1902 in Shaver, Boone County, Arkanas. They had 13 children. John died on November 10, 1940 in Sanger, Fresno County, California. He was 39. His Find A Grave memorial is here. Read more about him here. Joseph C. Hopper – Joseph was born in July 1886 in Mincy, Taney County, Missouri. The only record I have of Joseph is on the 1900 US Census when he was 13 and lived with the family in Boone County, Arkansas. Some online trees indicate that he died in 1902 in Denver, Carroll County, Arkansas. He was 15 or 16. Lillian May Hopper – Lillie was born November 17, 1888 in Young, Boone County, Arkansas. She married John Kelley on December 23, 1906 in Boone County, Arkansas and they had 5 children. In 1910 they farmed in Washington, Arkansas and in 1920 they were in Richland, Ohio where John worked as a construction foreman. John died September 25, 1926 in Indiana. On the 1930 US Census Lillie was 41 and a widow in Muncie, Indiana and lived with 4 of her children, and one’s spouse. Lillie married Irvin Norman Vauter, a machine operator at an automobile factory, by 1935. (In 1900 Irvin was 13 and an inmate at the Indiana Reform School for Boys Irvin. In 1910 he was 22, a baker living with parents and siblings. In 1920 he was 32 and in the Indiana State Prison. In 1930 he was divorced, 43, worked as a baker and lived with his mother.) In 1940 Lillian and Irvin lived in Muncie, Indiana with two of her children and a granddaughter. Lillie and Irvin both died in 1954 in Muncie, Delaware County, Indiana. She was 65 or 66. Her Find A Grave memorial is here. George W. Hopper – George was born October 22, 1890 in Young, Boone County, Arkansas. He married Hannah Mary Mills on April 12, 1914 in Reeds Spring, Stone County, Missouri. They had 5 children and farmed in Ruth, Stone County, Missouri. His World War I Draft Registration Card indicates he had light blue eyes, red hair, medium height and medium build. His World War II Draft Registration Cards indicates he was 5’3″ and weighed 15o pounds. George died on May 30, 1973 in Marionville, Lawrence County, Missouri. He was 82. His Find A Grave memorial is here. James Monroe Hopper – James was born on March 24, 1892 in Harrison, Boone County, Arkansas. He married Maude Breckenridge on February 1, 1914 in Stone County, Missouri. They farmed in Ruth, Stone County, Missouri and had 9 children there, then moved to Fresno, California sometime after 1933 and had 1 more child there. His World War I Draft Registration Card indicates that he was tall and stout, with light blue eyes and dark brown hair. His World War II Draft Registration Card indicates he was 5’11” and weighed 190 pounds. James died on June 27, 1962 in San Benito, California. He was 70. His Find A Grave memorial is here. David Isiah Hopper – David was born on October 15, 1894 in Boone County, Arkansas. He married Phebie Estes on October 3, 1917 in Reeds Spring, Stone County, Missouri. They farmed in Ruth, Stone County, Missouri, then moved to Indiana by 1931, where David worked as a machine operator in 1940. On the 1940 US Census they lived in Center, Delaware County, Indiana and had an adopted son William Crawford, age 18. His World War I Draft Registration Card indicates that he was tall and of medium build, with light blue eyes and red hair. His World War II Draft Registration Card indicates he was 5’10.5″ and weighed 210 pounds. David died on November 20, 1974 in Los Angeles, California. He was 80. His Find A Grave memorial is here. Mary Jane Hopper – Mary was born on August 9, 1895 in Alpena, Boone County, Arkansas. She married Frederick Samuel Hedrick on April 27, 1913 in Reeds Spring, Stone County, Missouri. They farmed in Flat Creek, Missouri and had 12 kids. (On the 1930 US Census, my grandfather William Henry Hopper, age 19, lived with them. Mary is his aunt, and he would eventually marry Euvella Hedrick, Frederick’s niece.) Mary died on August 12, 1995, 3 days past her 100th birthday, in Crane, Stone County, Missouri. Her Find A Grave memorial is here. Ida Medline Hopper – Ida was born on November 28, 1897 in Alpena, Boone County, Arkansas. She married Elmer Isaac Estes on August 9, 1914 in Boone County, Arkansas. They had 6 children. 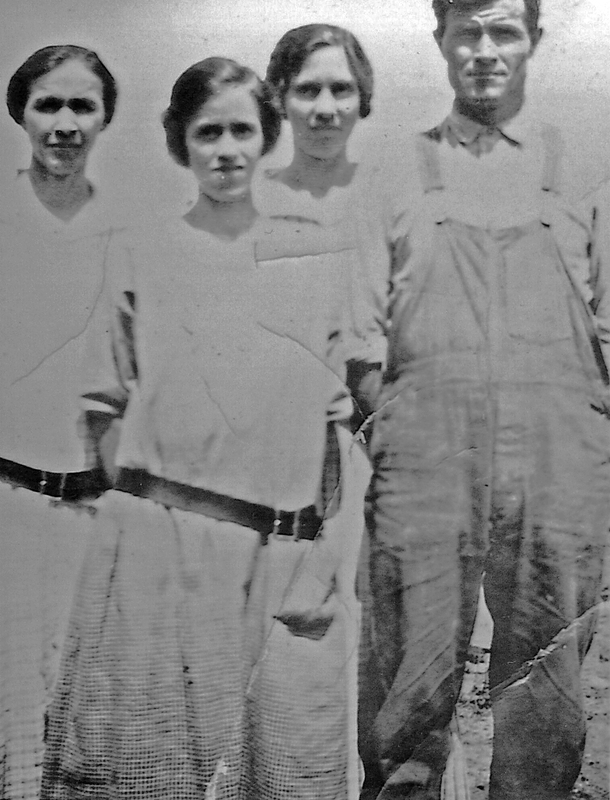 They farmed in Long Creek, Arkansas in 1920, and were in Winchester, Randolph County, Indiana by 1930. Elmer worked as a packer in a glass factory. On the 1940 US Census, both Ida and Elmer are working as packers at a glass factory. Ida died on April 25, 1977 in Muncie, Delaware County, Indiana. She was 79. Her Find A Grave memorial is here. Harve Lee Hopper – Harve was born on August 2, 1901 in Denver, Carroll County, Arkansas. He married Gertrude Edwards Wilton on June 8, 1927 in Boone County, Arkansas. They farmed in Long Creek, Arkansas and had at least 6 children. They divorced. Harve married Atha Linda Lloyd on March 18, 1972 in Aurora, Lawrence County, Missouri, when he was 70 years old. His World War II Draft Registration Card indicates he 6’2″ tall and weighed 180 pounds. He had blue eyes, red hair, and a ruddy complexion. Harve died on January 7, 1988 in Eureka Springs, Carroll County, Arkansas. He was 86. His Find A Grave memorial is here. Everett Crockett Hopper – Everett was born on December 5, 1903 in Denver, Carroll County, Arkansas. He married Sarah Ellen Baker on June 16, 1926 in Galena, Missouri. They had 4 children and farmed in Ruth, Missouri. Everett was struck by lightening and died on July 16, 1940 in Reeds Spring, Stone County, Missouri. He was 36. His Find A Grave memorial is here. Sigel Francis Hedrick and Mary Baker are my 2x great grandparents, the parents of my great grandfather James Wesley Hedrick. Sigel & Mary Hedrick and all of their children. My grandmother Euvella, daughter of their son James Wesley, gave me all photos I’ve included here. Sigel Francis Hedrick was born on December 11, 1862 in Missouri and was the son of Isaac Hedrick and Minerva Mathis. Read about them here. Mary Baker was born October 9, 1864 and was the daughter of William Baker and Sarah Elizabeth Davis. Read about them here. On 1870 US Census, Sigel was listed as Sigle Mathis. He lived in Washington, Stone County, Missouri with his uncle Greene Mathis after the death of his parents in 1868. He was 7 and his brother Joseph was 9. Brother Jacob isn’t found on the census. On the 1870 US Census, Mary was 6 and lived in Washington, Stone County, Missouri with her parents and siblings. On the 1880 US Census, Sigel isn’t found, but Mary was 16 and lived in Washington, Stone County, Missouri with her parents and siblings. Sigel and Mary were married on November 6, 1881 in Stone County, Missouri. Sigel was 18 and Mary was 17. On the 1900 US Census, Sigel was recorded as 34 and Mary was recorded as 33 but those ages are at least 2 years off. They were farming in Ruth, Stone County, Missouri. They had been married 19 years and had 7 children, all at home: Minnie was 18, William was 16, James was 12, Berton was 11, Franklin was 8, Fred was 6, and Vernie was 2. On the 1910 US Census, Sigel was 47 and Mary was 45 and they had 9 children, with 8 of them living at home. They were still farming in Ruth, Stone County, Missouri. I found it amusing that under the “years married” column, for Sigel it says 28 and for Mary is says 26. Hmmm. Daughter Minnie was 27 and was widowed. James was 22, Bert was 20, Frank was 18, Fred was 16, Vernie was 13, McKinley was 10, and Albert was 6. On the 1930 US Census, they were farming again in Ruth, Stone County, Missouri. Sigel was 66 and Mary was 65. Living at home was daughter Minnie Loomis, age 46 and widowed a second time; and daughter Vernie, age 31. On the 1940 US Census, Sigel was 78 and Mary was 76. They lived alone in Ruth, Stone County, Missouri. Son Elbert lived next door. Mary died on August 30, 1948 in Ruth, Stone County, Missouri. She was 83. Her Find A Grave memorial is here. Sigel died on March 15, 1950 in Ruth, Stone County, Missouri. He was 87. His Find A Grave memorial is here. Sigel and his sons, around 1949. His wife and two daughters had died. The sons from left to right, I was told, are Elbert, McKinley, Frederick, Franklin, Berton, James and William. Minnie Hedrick Perkins Loomis, Vernie Hedrick, and my great grandparents Versa Grace Richardson Hedrick and James Wesley Hedrick. Minnie Hedrick – Minnie was born July 7, 1882 in Stone County, Missouri. She married Jessie Perkins on May 31, 1900 in Stone County, Missouri. He died on December 7, 1901. She married Morgan Frederick Loomis after 1920 and he died on January 27, 1924. Minnie died on October 2, 1933. She was 51. Her Find A Grave memorial is here. William Hedrick – William was born April 30, 1884 in Missouri. He married Nora Francis Rich on September 15, 1904 in Stone County, Missouri. They had 4 children, and farmed in Stone County. William died on June 11, 1957. He was 73. His Find A Grave memorial is here. 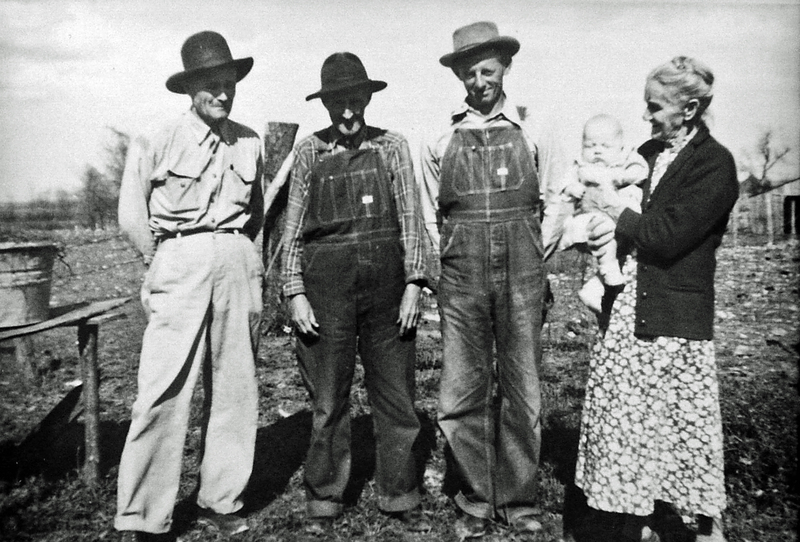 James Wesley Hedrick, his father Sigel Francis Hedrick, James’ son-in-law James Madison Mills, and James’ mother Mary Baker holding Jimmy Mills Jr.
James Wesley Hedrick – My great grandfather Jim was born October 7, 1887 in Galena, Stone County, Missouri. On October 26, 1913, Jim married Versa Richardson in Stone County, Missouri. They had 5 children. Jim on July 24, 1953. He was 65. You can see his Find A Grave memorial here. Read more about him here. Berton Hedrick – Berton was born February 7, 1889 in Missouri. He married Lillie Carr on March 5, 1911 in Stone County, Missouri. They had 3 children. In 1920 he was married and farming in Stone County, Missouri. By 1930 he was widowed and living in Porterville, California, doing odd jobs. By 1940 he was in Santa Clara, California working as a laborer. His World War II Draft Registration Card indicates he was 5’6″, 127 pounds, with brown hair, brown eyes and a ruddy complexion. He moved to Sacramento and owned restaurants. He died on November 30, 1974 in Sacramento. He was 85. His Find A Grave memorial is here. Franklin T. Hedrick – Franklin was born July 15, 1893 in Missouri. His World War I Draft Registration Card indicates he was of medium height and slender build, with brown hair and brown eyes. He married Bertha Wair in Reeds Spring, Missouri on April 12, 1914. They farmed in South Galloway and Ruth, Missouri. They had 9 children, and divorced before 1940. I can’t find Franklin in 1940 but Bertha was living with her children close to Frankin’s parents and some of his siblings. Franklin died June 27, 1964 in El Dorado, California. He was 70. His Find A Grave memorial is here. Frederick Samuel Hedrick – Frederick was born March 20, 1894 in Missouri. His World War I Draft Registration Card indicated he was of medium height and slender build with grey eyes and brown hair. He married Mary Jane Hopper on April 27, 1913 in Reeds Spring, Missouri. They farmed in Flat Creek, Missouri and had 12 kids. (On the 1930 US Census, my grandfather William Henry Hopper, age 19, lived with them. Mary Jane Hopper was his aunt, and he would eventually marry Euvella Hedrick, Frederick’s niece.) He died November 4, 1980. He was 86. His Find A Grave memorial is here. 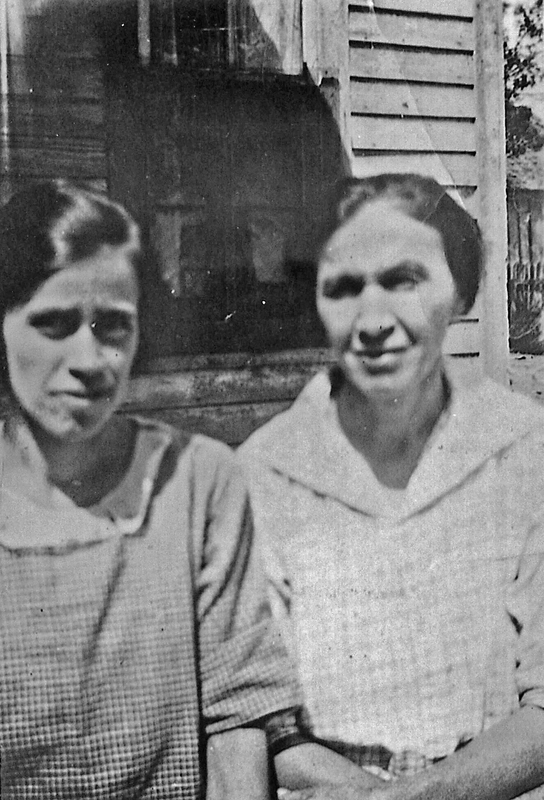 Vernie Hedrick & Minnie Hedrick Perkins Loomis. Vernie Hedrick – Vernie was born October 3, 1897 in Missouri. She never married and had no children. She died on October 10, 1931 of typhoid fever. She had been sick for 7 days, and was 7 days past her 34th birthday. Her Find A Grave memorial is here. McKinley Hedrick – McKinley was born November 6, 1900 in Missouri. He served in the Navy in World War I. On the 1920 US Census he was a patient at a naval hospital in California, and working as a seaman apprentice. He married Emma Catherine Hardin on November 25, 1921 and in 1930 they were farming in Flat Creek, Stone County, Missouri. On the 1940 US Census they were farming in Fresno, California. McKinley and Emma had 8 children. He died July 30, 1992 when he was 91. His Find A Grave memorial is here. Elbert Charles Hedrick – Elbert was born May 16, 1903 in Missouri. He married Tressie Dell Sharp in 1921 and they had 10 children. They farmed in Ruth, Missouri. He died September 20, 1991. He was 88. His Find A Grave memorial is here.